To VIP or not to VIP. 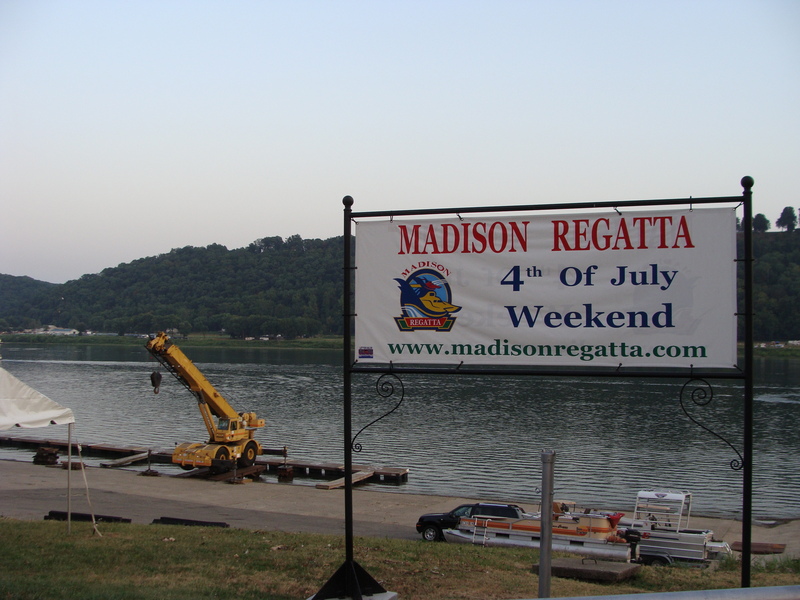 That was our first question when it came to the Madison Regatta. The tickets were much more than we had budgeted for the event, but we heard the heat might set records, and the appeal of air-conditioned bathrooms and a fanned tent was just too much to pass up. I also thought it would be good to have a place to sit and read. Even after watching Madison, the movie, I still wasn’t sure about watching a bunch of boats go around in circles. Could I really get excited about this? I ate my words the moment I saw the first boat. It was Thursday, and I was walking 2nd street home from climbing the stairs near the Heritage Trail. There it was at the corner of 2nd and Broadway: the Degree hydroplane. It sat glistening at me from the street, waiting its turn to go down to the pit. I don’t know if it was all the hustling and bustling of crew around the boat, or if it was because at that exact moment, Jack Bird and his grandson appeared on the street next to me. Whatever it was, I was in love. As much as I don’t want to admit it, during our year living in Los Angeles, I began to get pangs of longing when I saw the sleek lines of a Ferrari or Lamborghini. I imagined running my hand across the squeaky clean hood, leaning into the open top and inhaling the leather of the seat. Of course the reverie ended when I actually imagined trying to bustle my own minivan frame into that slender driver’s seat. Coming back to the ground, I listened as Jack pointed out that none of the boats have propellers on them. The propellers, it seems, are one of the secret ingredients in fast boats. He goes on to explain that one owner/driver is so proprietary about their props that he keeps it covered until the boat is lowered into the river and, with the propeller underwater, he removes the cover. 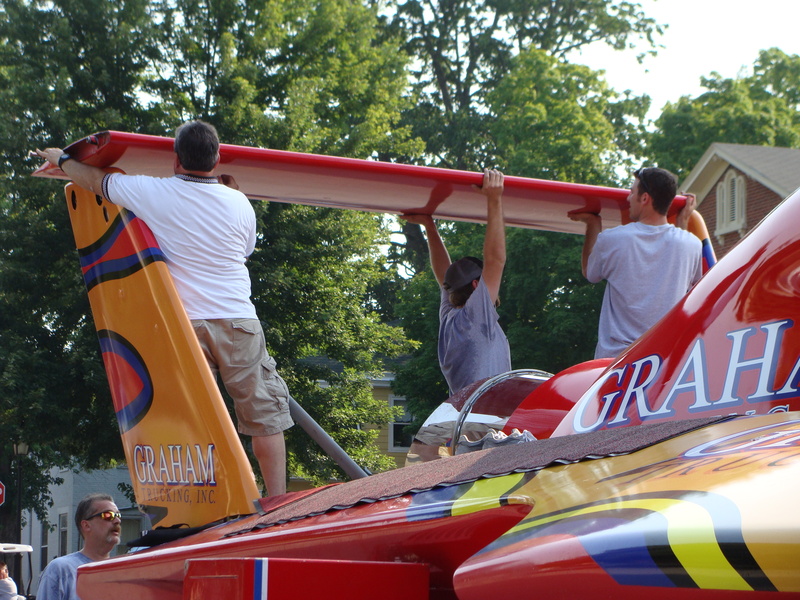 Then, once it’s done racing and before lifting from the water, it gets covered again. Really? I don’t know whether to turn this into another Will Ferrell/John C Reilly movie or be really geeked out. Part of me was in danger of getting hooked on these sleek boats and this racing hype. I hurry to step back from the Peters & May boat before I drool on its bright yellow paint. Will Ferrell’s character, then, would be cracking jokes about Reilly being flushed and the usual slew of fart, poop and pee jokes would splatter the rest of the movie. 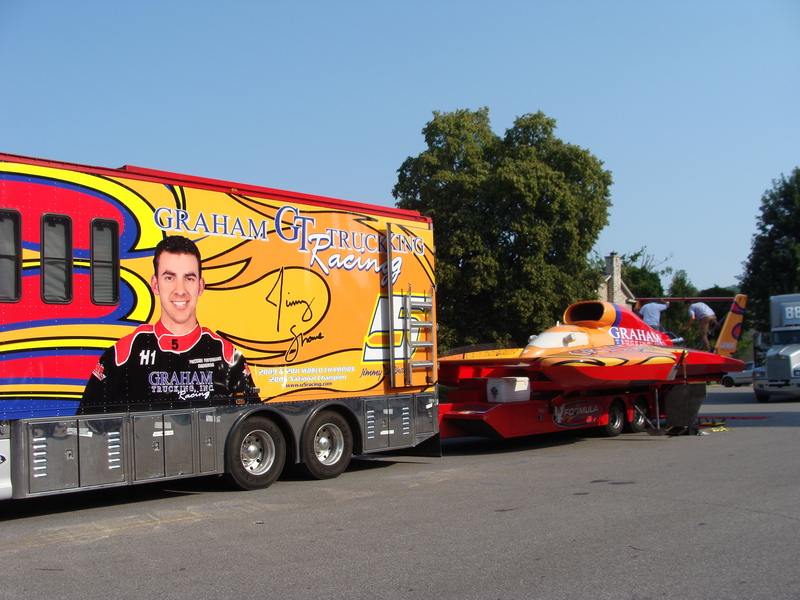 I try shaking the idea, but am greeted by the giant head of Jimmy Shane smiling down at me from the Graham Racing truck, and imagine Jimmy as the 3rd party villain, ultimately bringing Ferrell and Reilly together to conquer the dashing young troublemaker. “If you wait long enough, you’ll get to see Miss Madison.” I was grateful to Jack for interrupting the swirly my brain was giving the experience. “She comes in last, and she’ll be put at the west end of the pit.” Miss Madison. Between remembering the movie in the park and Jack’s next comment about ownership (the one I told you about in my previous blog) I was back in non-fiction mode and excited to watch the test runs the next day. 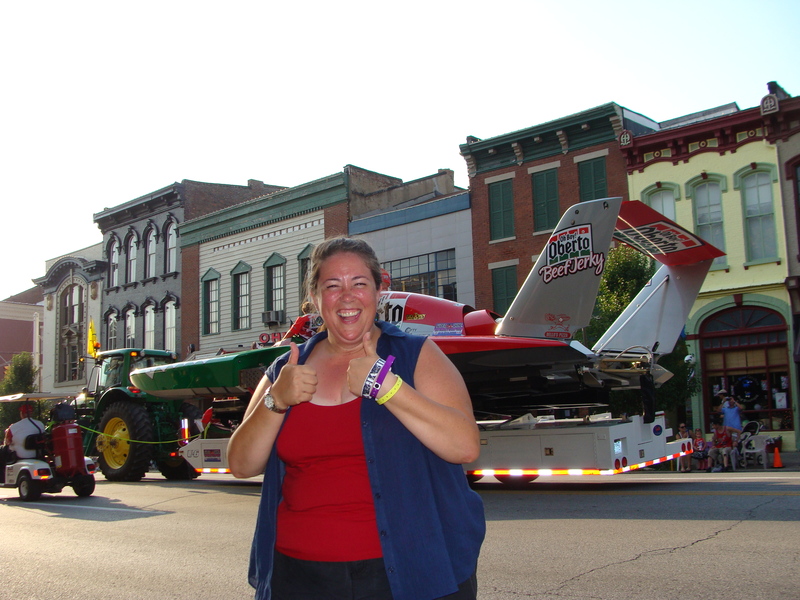 On Friday we took advantage of our cold pit passes to tour the pits and watch the boats getting lowered into the water. It was then I saw the Miss Madison boat. It was a crushing blow. Having watched the movie, we were hyped for the nostalgia of the Miss Madison of yesteryear. I knew that the boat was now a hydroplane and fitted with nitro. Jack had informed me of that, as well as the name of the sponsor, Oh Boy! 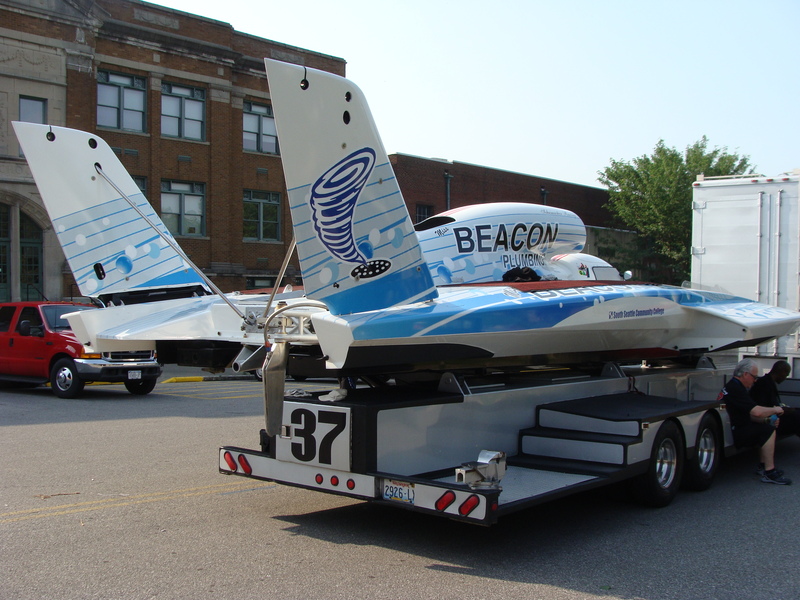 Oberto, who had even donated a new boat to the citizens of Madison. 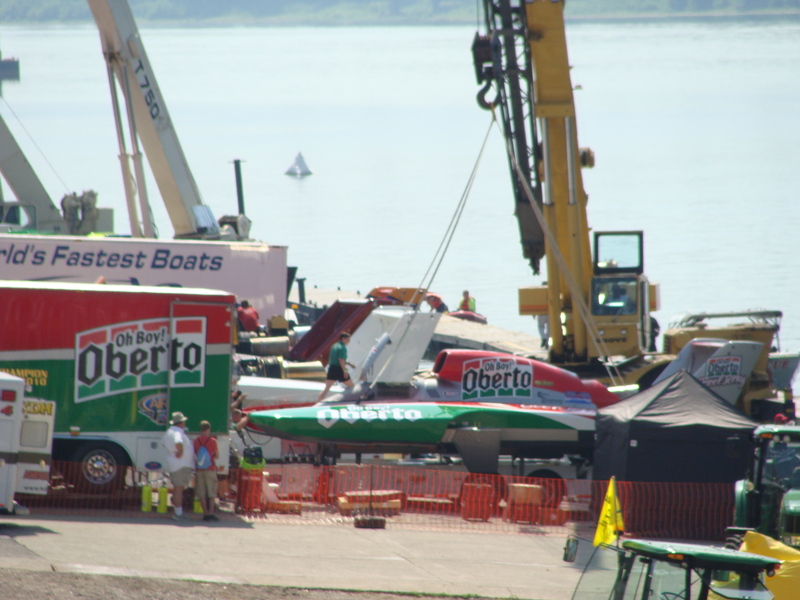 The problem wasn’t that it was a modern hydroplane I was looking at, and I didn’t mind the red, white and green colors because isn’t Oberto, after all, founded by Italian immigrants? What I couldn’t wrap my brain around was that the very thing that I wanted to see on this boat was the only thing I didn’t: the name Miss Madison. There were certainly plenty of spots for it. I imagined it in cursive across the green rectangles of the Oberto logo, or maybe across the red of the body. Wait! Is that it? I saw cursive writing on the red body and moved in closer, only to discover the words Beef Jerky in pretty lettering. I’m sure it was there somewhere, but I couldn’t find it all weekend. My disappointment, though, was short-lived, as a bystander hollered “Look! 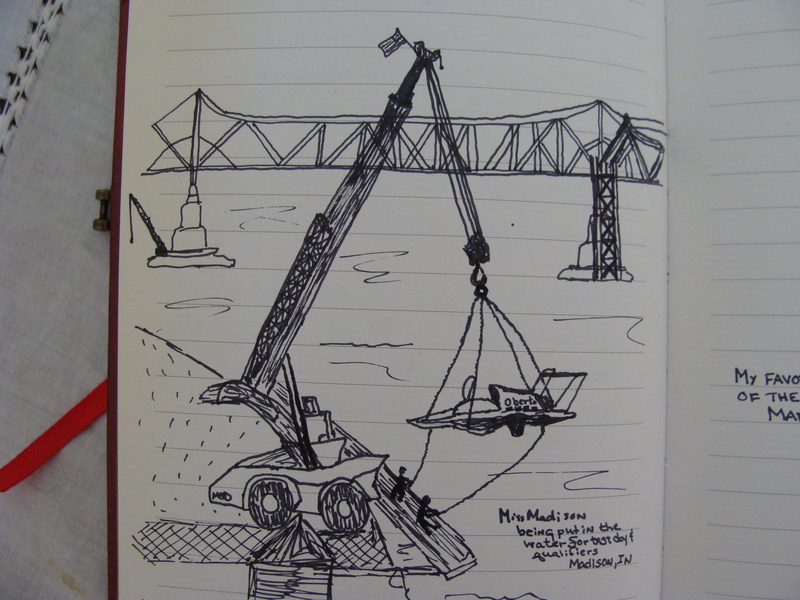 We’re on the hook!” Sure enough, the straps were stretching taut as the crane lifted Miss Madison from the pit to the water. Strong crew members held straps from the dock to align and steady, setting her down perfectly into position. 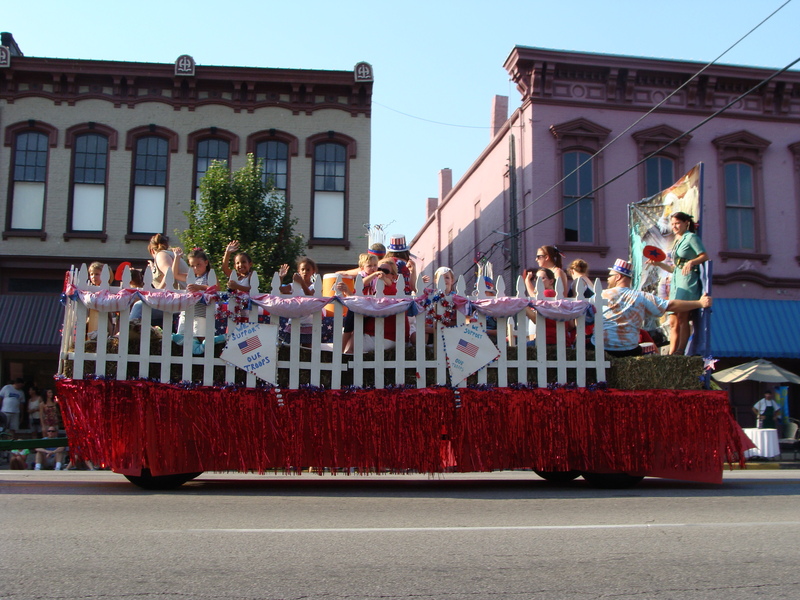 How does a town have such devotion —from random fans on the riverbanks and from a pit crew made primarily of volunteers? I don’t have time to wonder about this before the man continues. “Yeah and it’s too bad about Fred. They’re gonna’ run a race for him. He died this year, you know.” I didn’t know, but I was now baking in the heat and apologized for leaving, returning to wait in front of one of the large fans of the VIP tent until Kurt returned from taking photos in the pit. I would find out later that Fred Leland was an icon in Unlimited Hydroplane racing and more importantly, one of the kindest and most ardent proponents of the sport. They talked about him over the PA during regatta weekend. They spoke of races in which he would go around to opponents getting them parts and helping ensure they could all enter the race, because it was the race itself that mattered, more than the win. Not that he didn’t know about winning. It seems his team came away with two gold cups and numerous wins. It’s hard not to be drawn into boat racing when you sit on the riverbanks with locals, listening to the stories as you watch the boats taking their test laps. 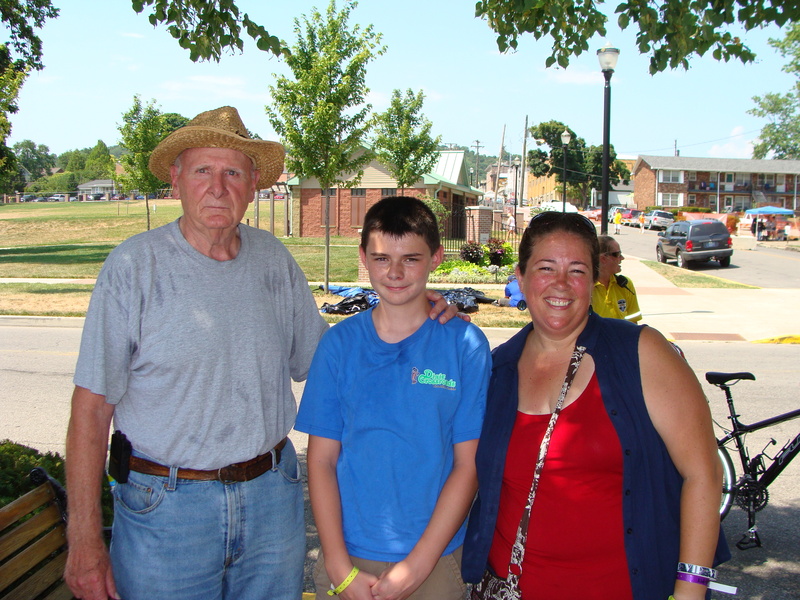 And what would be a day in Madison without running into Jack Bird and his grandson? 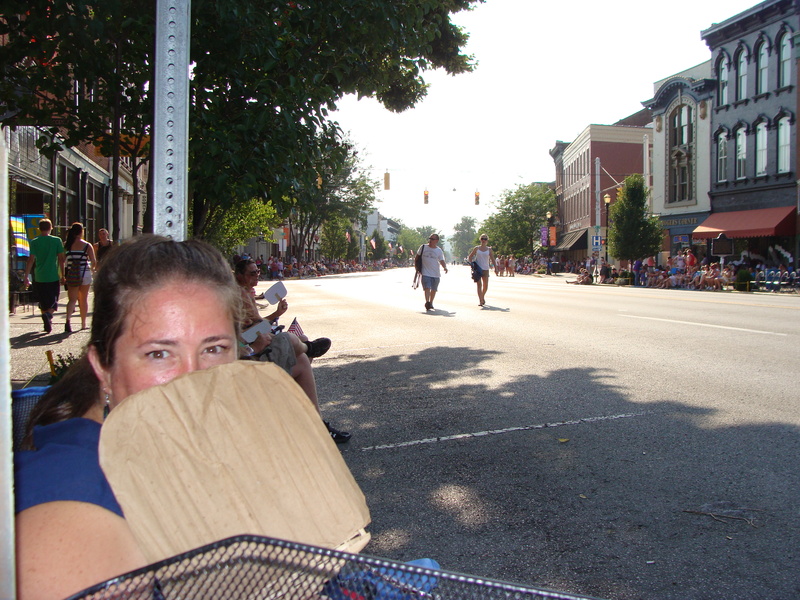 But we finally pulled ourselves away and headed downtown, taking a couple chairs to go set up for the parade on Main Street. Even at 5:30, with an hour to go, we were lucky to nab a couple shaded spots near my favorite hangout, Village Lights Bookstore. We grabbed subway and enjoyed the parade. 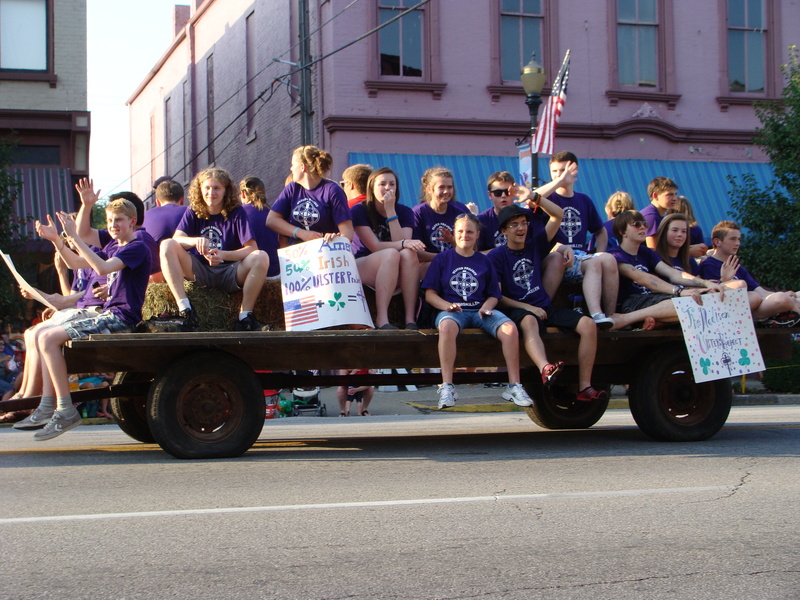 I’ll give you a photo blog of the parade this Saturday, but in the meantime, please enjoy these few favorites. Aww, who doesn’t love Girl Scouts? That is seriously one, big machine. The Ulsters!! Yes! The Ulsters represent! What saved it were really the regatta boats. 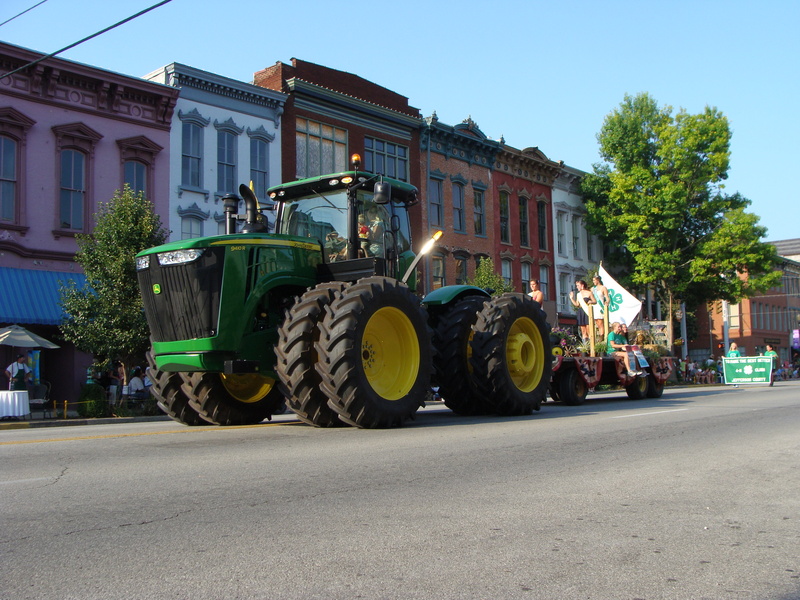 You don’t see that in every small town. Near the end of the parade, happily having had my fill of marching bands, cars, princesses, and Shriners, a single man holding a sign turned this long affair into the best parade ever.I had been shifting in my seat, taking photos and staring half-attentively at the parade as it went by, and almost missed him. I jumped from my seat hoping to have Kurt take a photo of me with the fella. I was even tempted to just start marching with him. As I jumped up, I dropped my camera, breaking the flash feature. This drawing of my favorite part of the parade, my favorite part of Madison, of life, is what I’m choosing to leave you with today. Cool post!! LOVE the artwork!! Points of gratitude today. Regatta post tomorrow. Crowded thoughts, safety shots, hydroplanes and fireworks. Regatta Part 2 of 3.